Now that I have given a brief about my childhood and my upbringing, if I say that the 2006 movie, Veyil had an astounding impact on a 12 year old me, not just by its content but majorly through its audio, you wouldn’t be surprised, right? When you hear that a boy, only few years elder to you is the brain behind such a remarkable album, you are certainly going to be amazed and I wasn’t an exception. Yes, I am talking about GV Prakash - The Music director. Since then he has held my admiration for his work. “Pookal Pookum Tharunam” was the song that qualified to become my first ringtone as soon as I received my own mobile phone. “Angnyaade” from Raja Rani is still a strong contender in my playlist. Not to forget the “lungi dance” moments that I have had with the “Otha Sollala” song in college days. His music has not only touched me but simultaneously entertained and has become part of important memories. June 17th, I watched the first day, first show of Enakku Innoru Peru Iruku (EIPI). From this point, I need to give you a whining alert. EIPI is not the kind of film I want to watch as an admirer of GV Prakash. In fact, Trisha Illana Nayanthara too was a disappointment. This is not any “FEMINISM CRAP” as some might categorize it as. This is simply the cribbing of a true cinema lover who thinks such content and characterisation will only mark the beginning of a cursing trend in the industry. You may ask if just two films can kick-start a trend? Please remember what we have done to the poor genre “Horror” and its unclaimed child “Horror comedy”. Now you might understand my point better. From a film like Pizza, we have ended up with few which are not even worth mentioning. Now that EIPI is performing well at the box-office, makers are automatically going to be convinced to make more such films. Two weeks ago, a film with an entirely different shade and motives released; Karthik Subbaraj’s Iraivi kept me in its zone for almost three good days. But when I learn that the number of shows in its 3rd week has been reduced, it gives me an unexplainable pain and fear. This piece of writing is the cumulative effect of the expected rise of EIPI and fall of Iraivi. 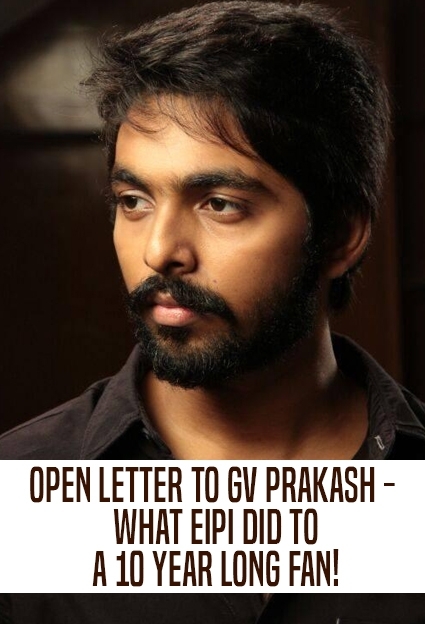 I would like to stress that I am not against the idea of GV Prakash turning into an actor. Darling and Pencil are films that worked for me and I spotted him doing some good job in this space too. My only concern is the kind of content he is presenting through films like TIN and EIPI which is high on adult content but weak in concept. I also noticed that not one song from EIPI had its retention value, but TIN at least had some catchy tune. GV is currently one busy actor in K-town and in this mad rush I only hope that the great musician in him does not enter hibernation. Don’t we want to listen to more songs like “Karuppu Karuppu” from Kaaka Muttai and “Avatha Paiya” from Paradesi? Considering my profession, I am still going to keep an open mind while going to watch Kadavul Irukan Kumaru rather all his next films. I really hope GV resumes his spot in my treasured film database. What next? Kabali in space? Vijay, the youngest 42 year old! Why Dhanush’s smooches in Thangamagan are special! Why Vedalam didn't face any roadblocks like Puli? Oscar awards and all the fuss! OH KADHAL KANMANI (2) IN 2025? A must watch for movie buffs! "Naan Unakku Pei Padam, Nee Enakku Bittu Padam Dee", SERIOUSLY? GV Prakash - "Sorry if we have hurt your emotion!" Tamil Music Composers score for JURASSIC WORLD!